The Murray surname is a common Scottish name. I do not know the meaning of the name, nor do I know much about the ancestry of our family. Our earliest definitive ancestor was James Murray, born 1819 in Pennsylvania. Current belief is that he was a grandson of Daniel Murray of Huntingdon County, Pennsylvania. Unfortunately, this is unproven. I would like to get in touch with any living male Murray descendant of James Murray. I will gladly pay for a DNA sample, so that we can attempt to put the issue to rest. Daniel Murray was born circa 1750 in Scotland (or possibly in Ireland). Daniel died after 1810 in Pennsylvania or Ohio. According to family tradition, he joined the British Army during the American Revolution to fight the colonists. It is said though that after arriving in America, he deserted the British army and joined the American army. Sometime after the war (or probably during the war, late 1770's) Daniel settled himself down in an area on the frontier of the American border, Huntingdon County, Pennsylvania. Daniel married in the late 1770's, although the name of his wife is not known. They had 5 known children: John, Thomas, David (see next generation), Catherine, and Daniel. Daniel continued living in Huntingdon County, Pennsylvania (this area would become a part of Blair County, Pennsylvania in the 1840's) in Franks Township. Daniel's wife appears to have died sometime during the 1790's. Daniel died sometime after 1810. While he probably died in Pennsylvania, it is possible that he moved with his son John to Montgomery County, Ohio, and died there. According to his grandson, Daniel was a very tall man, who constantly spoke about his physical feats as a young man. Also, he is said to have been rather poor in his old age and sold knit stockings in order to survive. Daniel married name unknown circa 1770's in Pennsylvania. She appears to have died Huntingdon Co., Pennsylvania sometime between 1790 and 1800. 2 Thomas Murray was born circa 1778 in Huntingdon (now Blair) Co., Pennsylvania. He died in what is now Blair Co., Pennsylvania. 4 Catherine Murray was born circa 1784 in Huntingdon (now Blair) Co., Pennsylvania. She died in Ohio. She married Mr. Taylor. 5 Daniel Murray was born circa 1790 in Huntingdon (now Blair) Co., Pennsylvania. He died after 1815. David Murray was born circa 1780 in what was then Huntingdon but is now Blair County, Pennsylvania. He died after 1820. The David Murray who was living in Huntingdon County, Pennsylvania in 1820 (with what appears to be a wife and 6 children) is most likely the father of James Murray. It is probable that this David Murray was the son of Daniel Murray, a pioneer of Huntingdon County. What is not at all clear is what happened to David Murray and his family after 1820. He left no further trace (that I can find) in Huntingdon County (or surrounding counties). According to an autobiography by David's nephew; David had a large family, of whom two of the sons were named Jacob and Daniel. Apparently the family made plans to move to "northern Pennsylvania", and then lost contact with them at the time. Some researchers have postulated that he was the same David Murray who had married Barbara Baker and settled in Clarion County, Pennsylvania before his death in 1844. Unfortunately if that is true, he could not have been the father of our James Murray (David and Barbara Murray had a son named James Murray who was obviously a different person). There was also a David Murray and wife Agnes "Nancy" Murray who settled in Allegheny County, Pennsylvania where this David died in 1828. More research is obviously needed. An educated guess at the name of David's wife is "Mary." He married to name unknown in about 1802 in Huntingdon (now Blair) Co., Pennsylvania. She died after 1820. 1 Jacob Murray was born circa 1803 in Huntingdon (now Blair) Co., Pennsylvania. He died after 1820. 2 Daniel Murray was born circa 1803 in Huntingdon (now Blair) Co., Pennsylvania. He died after 1820. 3 unknown female Murray was born circa 1808 in Huntingdon (now Blair) Co., Pennsylvania. She died after 1820. 4 unknown female Murray was born circa 1812 in Huntingdon (now Blair) Co., Pennsylvania. She died after 1820. 5 unknown female Murray was born circa 1814 in Huntingdon (now Blair) Co., Pennsylvania. She died after 1820. 6 unknown male Murray was born circa 1816 in Huntingdon (now Blair) Co., Pennsylvania. He died after 1820. James Murray was born on December 30, 1819 in Martinsburg, Huntingdon (now Blair) County, Pennsylvania 1,2,3. He died on May 3, 1885 in Manzanita Pct. (now Medford), Jackson Co., Oregon 1,3. He is buried in the Central Point I.O.O.F. Cemetery, Central Point, Jackson Co., Oregon. There is nothing known of James' parentage. His obituary only mentions that he was born at Martinsburg, Pennsylvania. The assertion that James was the son of David Murray comes from the fact that David Murray is the only Murray household in (or in the vicinity of) Martinsburg in the year 1820. Also, the fact that James named his oldest son David makes this theory more believable. Any information beyond this is wild speculation. Even though David's was the only Murray household in that location in 1820, James could have been living in the household of a different surname. Also, even if his father's name was David Murray, details of his life and subsequent family connections are completely unknown. According to his obituary, James was born in Martinsburg in 1819 and moved to Illinois in 1845. Whether this means he lived in Pennsylvania until 1845 is a matter of interpretation. He could have lived in another state during that time period. He appears to have moved to Illinois by himself, where he settled at Stephenson County. He was living there in 1850, boarding with a German family. The same year he married Flora Bartlow and they settled in Loran Township, where they began to raise a family. They had 12 children, of whom 8 lived to adulthood. James and Flora eventually decided to move away from Illinois. In the fall of 1871 (or perhaps in 1870), James and his family left Illinois and moved to southern Oregon. They purchased a farm of 160 acres along Bear Creek in what was called Manzanita Precinct, several miles northeast of Jacksonville. This farm was close to two cities that would spring up around them: Central Point and Medford. Today the land is within Medford's city limits and is bordered by the Crater Lake Highway. A Wal-Mart store sits on part of the land. According to James' obituary, James was raised as a Methodist Episcopalian, but changed his religious affiliation (the obituary is cut off there). James Murray died at his farm in Manzanita Precinct on May 3, 1885 from "paralysis of the heart," at the age of 65 years. He married Flora Ann Bartlow on November 3, 1850 in Loran Twp., Stephenson Co., Illinois 4. 1 David Murray was born on August 29, 1851 in Loran Twp., Stephenson Co., Illinois 2. He died on December 2, 1855 in Loran Twp., Stephenson Co., Illinois 2. 2 Samuel H. Murray was born on June 3, 1853 in Loran Twp., Stephenson Co., Illinois 2. He died on September 8, 1918 in Central Point, Jackson Co., Oregon 5. He is buried in the Central Point I.O.O.F. Cemetery, Central Point, Jackson Co., Oregon. 3 James Murray was born on August 30, 1854 in Loran Twp., Stephenson Co., Illinois 2. He died on June 18, 1856 in Loran Twp., Stephenson Co., Illinois 2. 4 George W. Murray was born on November 15, 1855 in Loran Twp., Stephenson Co., Illinois 2. He died on November 7, 1930 in Hanford, Kings Co., California. 6 John B(artlow?) Murray was born on November 15, 1858 in Loran Twp., Stephenson Co., Illinois 1,2. He died on January 31, 1883 in Manzanita Pct. (now Medford), Jackson Co., Oregon 1,2. He is buried in the Central Point I.O.O.F. Cemetery, Central Point, Jackson Co., Oregon. 7 infant male Murray was born and died on September 16, 1860 in Loran Twp., Stephenson Co.,Illinois 2. 9 Eleanor Murray was born on August 27, 1861 in Loran Twp., Stephenson Co., Illinois 2. She died on December 4, 1931 in Multnomah, Multnomah Co., Oregon 6. 10 Sarah Jane Murray was born on June 3, 1863 in Loran Twp., Stephenson Co., Illinois 2. She died on December 11, 1920 in Beagle, Jackson Co., Oregon 7. 11 William M. Murray was born on April 2, 1866 in Loran Twp., Stephenson Co., Illinois 2. He died on April 17, 1921 in Ashland, Jackson Co., Oregon 8. 12 Anna E. Murray was born on January 16, 1868 in Loran Twp., Stephenson Co., Illinois 2. She died on March 28, 1905 in Ashland, Jackson Co., Oregon. Mary Elizabeth Murray was born on May 6, 1857 on her parents' farm in Loran Township, Stephenson County, Illinois 2,9,10,11. She died on October 7, 1923 in Medford, Jackson Co., Oregon 9,10,11. She is buried in the Eastwood I.O.O.F. Cemetery, Medford, Jackson Co., Oregon. Mary was raised in Stephenson County, Illinois, where her parents were moderately successful as farmers. In the fall of 1871, Mary and her entire family moved out west and settled on a farm of 120 acres in Manzanita Precinct, Jackson County, Oregon. Mary was 14 years old at the time of the move. She was the third surviving child and first daughter of a family of 10, and would surely have had a lot of childhood responsibilities. While living in rural Jackson County, Oregon, she formed the acquaintance and interest of a local young man named George Merriman who lived on a farm a few miles away. Sometime during the 1870s they formed a relationship and became engaged [at least before July 1877]. 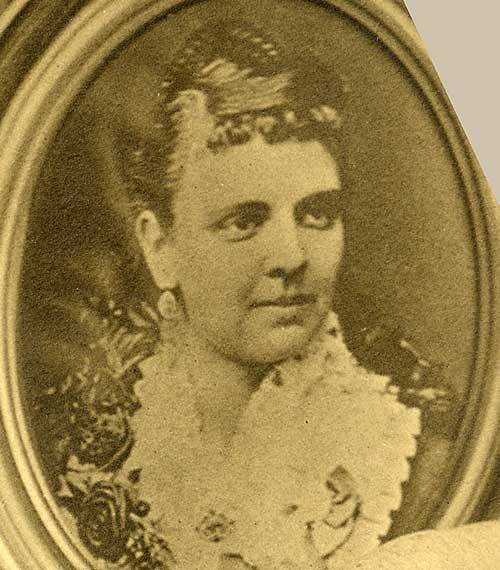 Mary was married to George Merriman on November 8, 1877, at her parents' house in what is now Medford, Oregon. After their marriage, Mary and George continued living in the area. They either lived with his parents or in a rented home in the vicinity. George was a blacksmith and at that time was the proprietor of his own shop in the newly formed town of Central Point. 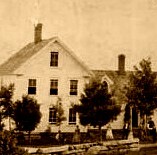 They continued living in the area until 1880, when George had the opportunity to work as a blacksmith in the town of Oakland, Douglas County, Oregon. The family moved to Oakland in late 1879 or early 1880. Meanwhile, in the early 1880s, a city named Medford was formed in Jackson County, Oregon, a few miles south of where Mary and George were raised. In 1884, Mary and George moved to Medford, Oregon and opened up one of the first businesses, a blacksmith shop, in the center of the town. After renting a home for a few years, in 1891 George and Mary purchased a home at 520 C Street (now Central Avenue) in Medford, Oregon. They lived at this home for the rest of their lives. Mary had a total of 10 children: William, Thomas, Mary, Creed, George, Blanche, Frank, Mollie, Vera, and Sharon. Sadly, three of those (William, Creed, and Frank) died in infancy. George operated his blacksmith shop for the rest of his life where he was moderately successful. He and his wife were pillars of the community. As for religious affiliation, there is no record of George and Mary ever attending any church. George was raised as a Baptist, while Mary's family had connections to the Methodist church. It is significant that most of Mary's children became Catholics, and the family also had connections to the Christian Science church. Mary was a loving woman. She enjoyed music and was a piano player. In their old age, the health of George and Mary Merriman deteriorated. In 1915, George Merriman died after a sudden illness at the age of 60. Mary continued to live at their Medford home with their youngest children: Vera and Sharon. She had severe rheumatism and ultimately became confined to bed. In 1917, she wrote her will and left the bulk of her estate to her son Sharon. In 1920, Mary was living temporarily in San Francisco, California, where three of her children lived. It seems that in her old age, she was cared for primarily by her daughter Vera Merriman Plymale. Mary died at her home in Medford, Oregon, on October 7, 1923 from endocarditis (heart failure). She was 66 years old. She was buried in the Merriman plot in the Eastwood I.O.O.F. Cemetery in Medford, Oregon. Mary married George Francis Merriman on Novemer 8, 1877 in Manzanita Pct. (now Medford), Jackson Co., Oregon 12.